The size of this book is large for BibSpider and is necessitated by publishing the text sequentially in German and English, nevertheless the book is easy to read and handle and not in the least off-putting, and the editor must be congratulated on this. The initial pleasing impression is of a well printed book on good paper. The footnotes are repeated with serial numbering in the English version. Biographical notes are given on the contributors. The editor’s preface gives the book’s origin is a result of a Berlin conference with a similar title organised jointly by the Information Resource Center, Berlin, the American Embassy and the Association of West East Information Transfer e.V. held in 2003. The paper by Denise Hibay was the keynote speech at that conference. The book is dedicated to the memory of Rosemarie Bittner, former head librarian at the Information Resource Center and the conference organiser. 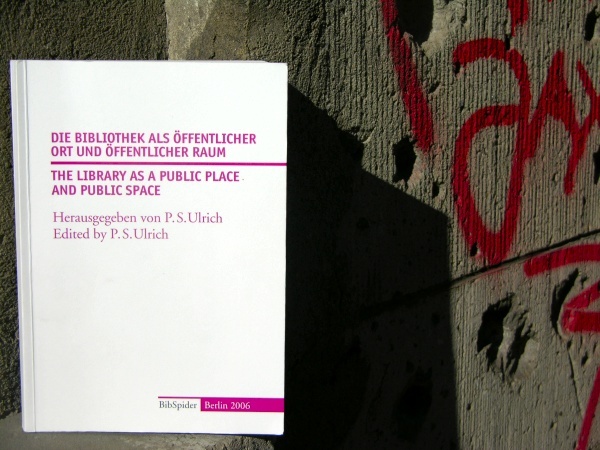 In his preface Paul S. Ulrich depicts many fresh international library developments. He emphasises that: New library buildings place new and greater obligations on public areas; The relationship between library and urban space takes on an ever greater value for the life of the community; New library buildings express an attempt to rescue or at least provide a new value for public buildings; The demand that librarians advocate and publicise their offerings outside the library which is explored in detail by the paper by Wilson and Tehrani. At a time when society places complex demands on libraries this book is timely and these papers deserve careful attention if we librarians are to absolve ourselves from the charge by Olaf Eigenbrodt „during the planning process librarians tend to see themselves as exclusive users of the building”. Marylaine Block summarises and defines the differing requirements for space in a library. These can vary from community to individual use and from quiet reading or study spaces to the children’s library where activities take place. Her approach is part historical and part analytical. The latter is helpful for planning ahead. Michael Dewe’s theoretical and somewhat philosophical contribution is stimulating. He discusses the rebranding and reinvention of the library and asks that more be involved than merely a fashionable change of name. He also treats the purposive use of space and relates it to commercial bookshops and supermarkets, but suggests that for financial reasons libraries may not be able to adapt their space as quickly as retail outlets and therefore need to plan more carefully. Apart from the library interior he also considers the library in its exterior setting. Myoung C. Wilson and Farideh Tehrani present a detailed account of marketing academic libraries and their services to students when these are in non-library spaces. The libraries are the Rutgers New Brunswick/Piscataway Campus Libraries. The accounts of planning, preliminary research and outcomes from this experience are reinforced by statistics. The general discussion of marketing terminology described in the first two sections is valuable for non-academic libraries but the detail in section 3 (Examples of Marketing Practices at) is not particularly relevant for the book’s topic. He rejects the dogma of Harry Faulkner Brown’s „total flexibility” which he considers leads to a muddled, uncomfortable and non-defined use of space which is confusing for the library user and staff alike. He states that „it is however helpful to distinguish between zones for concentrated study or for meetings and communication…this is the only way to create the „meaningful places” whose social function can be „read” in the structure of their spaces”. The paper by Denise Hibay describes the history and response to the community over the years but particularly the use of the New York Public Library and its branches, when people of all ages flooded in after 9/11. It is an immensely moving testimony to the stability and attraction of a great institution in a time of upheaval and stress. Various initiatives used by the Library as an appropriate response to the disaster are described. These include availability of the internet for communication with relatives, reading programs and activities for children, psychologists and social workers to lead discussions but above all the fact that the day after 9/11 the Library simply opened its doors to the people. „They came together in a place that asked nothing of them as citizens, but which gave them a sense of citizenship, a sense of community”. In the description of the new main library in Vienna – die neue Hauptbücherei der Bücherei Wien – opened in April 2003 Alfred Pfoser depicts the success of the new library and the new fractal organisational structure which, reflected in the architecture that is based on the zoning of the various departments (colleges). He maintains the concepts of zoning for different library functions have been mastered. The reader would have benefited, in this paper more than anywhere else in the book, by the inclusion of pictures. I was sceptical about the idea of a large staircase symbolising openness and would have appreciated a picture to give his statement substance. Paul S. Ulrich reiterates many of the ideas he put forward in his thought – provoking preface to the book. In this paper he focuses on the importance of the library user and on planning space and furnishings for attractiveness, ease of use and access. In the future this aspect will be paramount and may well pose the greatest challenge. Marylaine Block stresses the importance not only of developing user-friendly features but also of making sure they are featured in your library website and other publicity material. Although only 4 of these papers deal directly with the stated topic, this book is a valuable collation of current thinking on this and related topics and a stimulus to further research.